Did you wake up today, look at your calendar and realize it was already December 15th? Holiday shopping done? Didn't think so. Don't fret. You actually have two full weekends to shop. That does not mean you should put it off until next weekend. One of my favorite spots to pick up some gifts is the Holiday Market in Union Square. Maybe it is my German heritage, but I get excited when I see the tents going up. I always do well finding gifts there for family and friends. The good folks who run it have made the experience of shopping there even better this year by stepping up the food and drink options at the market. It makes sense in these hand crafted, food driven times. And as we all know, shopping, especially during this time of year, can be draining. The Union Square Market is stocked with delicious pick-me-ups. From meatballs at Mighty Balls to crepes at Bar Suzette and dumplings from Hong Kong Street Cart, there is something for everyone. Here are my highlights so far. I will update the list as I sample more. 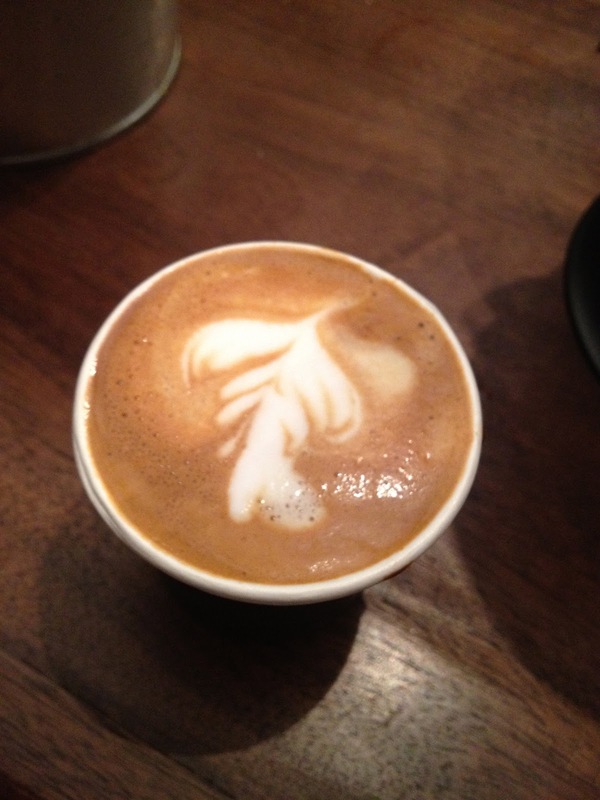 Toby's Estate Coffee - The Australian coffee maker with an outpost in Brooklyn brings its excellent coffee and espresso drinks to the market. As the sun sets and the temperature drops along with your stamina a nice espresso or macchiato is the perfect pick me up. La Sonrisa Empanadas - The ideal food for shopping at an outdoor market is something that is hand held, not to messy, warm (in the cold weather) and delicious. 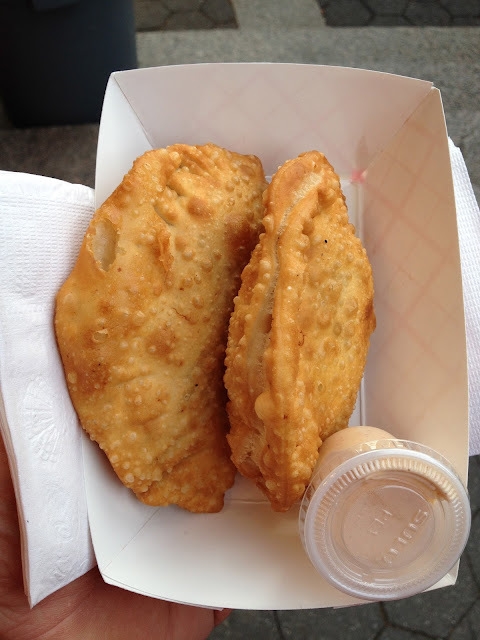 La Sonrisa Empanadas fit the bill perfectly. Hand sized pockets of warm, chewy dough with a crisp skin are filled with a variety of fillings. I had the Pulled Pork and the Coconut Curry Chicken. The Pulled Pork was deeply flavorful with a rich mix of spices and bell peppers. The Coconut Curry was lightly sweet and spicy with a relatively mild hand on the curry. I went with some chipotle mayo on the side. Hot sauce is available as well. These are the best empanadas I have had in some time. Mayhem & Stout slow braised sandwiches - Do you like a nice sandwich? How about one with slow braised meat? Mayhem & Stout is for you. The menu is a "build your own" board. Pick a meat, pick a sauce, pick an add on. Simple. The sandwiches are available in half (really a bun) and whole (a hero roll). I had never tried Mayhem & Stout so I asked the gentleman running the booth what he would recommend. After considering for a moment he replied, "Pork shoulder, Golden BBQ sauce and pickled onion." "Done," I said. Now, being the smart boy I am, I asked what his second choice would be. "Brisket, Dragon Sauce (Asian BBQ) and spicy slaw." "Great. I will take a half sandwich of both," I said definitively. Two home runs. Both meats were juicy, tender and falling apart. The bun is a perfect vehicle for the sandwiches. Nice crumb, flavorful and stands up to the fillings without falling apart. The pork is nicely seasoned. The Golden BBQ sauce is rich and spicy and slightly creamy with a hint of mayonnaise. The pickled onion adds a nice sour bite. The brisket with Dragon Sauce and Spicy slaw eats like an Asian riff on a classic BBQ brisket sandwich and is just straight delicious. I cant wait to get back and try more combinations. 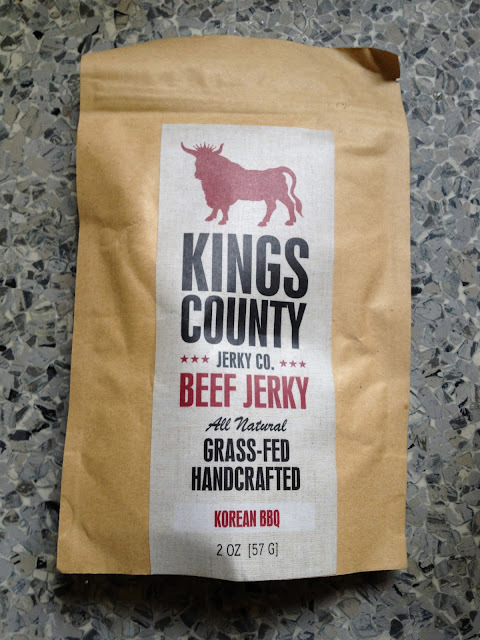 King's County Jerky Co. - Brooklyn based (of course) King's County Jerky Co makes beef jerky with grass fed beef. If you want to make the case as to why hand crafted, "artisinal" food with the best local products actually makes a difference, start with this jerky. Anyone who has eaten the mass-produced stuff you get in gas stations and 7-11s will be stunned. King's county jerky is lean, slightly moist and exploding with flavor. No artificial ingredients. Just beef and spices. It comes in three flavors; Original, Korean BBQ and Sichuan Ginger. I am partial to the Koren BBQ. At $10 for 2 ounces it is pricier than your convenience store brand but, as they say, you get what you pay for. King's County Beef Jerky is a great portable treat and very tasty way to get a quick hit of protein.